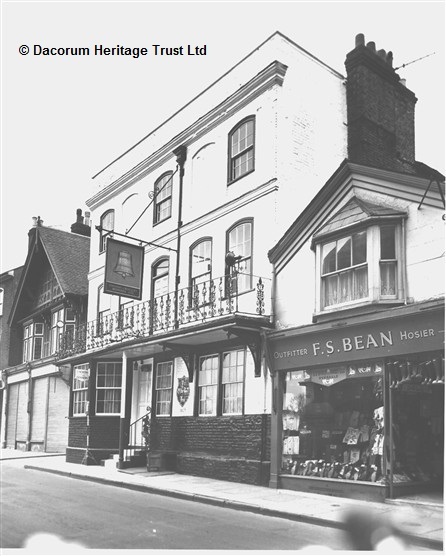 At one time there were 24 licensed premises in the High Street, Hemel Hempstead, but now only four remain. It is difficult to trace exactly where all the best known pubs were located over such a large time span as five centuries, especially as the High Street was not numbered until the later nineteenth century. Some disappeared altogether and others become private houses or other businesses. Also, many were squalid beer houses, which did not appear in trade directories. However, the use of the Billeting Return of 1756, later trade directories, censuses, wills, inventories, plans and newspapers have made it possible to locate many of the lost inns. Nineteenth century photographs and eighteenth century lithographs and prints also provide invaluable source material. Before the search for the lost pubs, it is best to look at the four licensed pubs that still remain. The Bell at No 51 was the largest and most prestigious inn of the High Street. The Billeting Return of 1756 reveals that Thomas Edge, then landlord of the Bell, had room for nine beds and stabling for 54 horses. 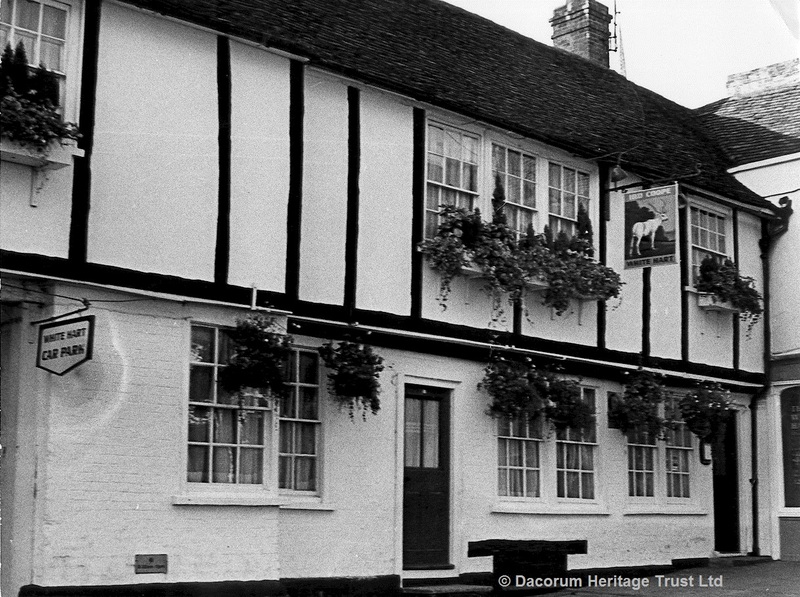 Dating from 1603, the original inn still exists, but is hidden by a later eighteenth century extension which was built to level up the building line of the street. The King’s Arms, which is the second of the remaining inns, is situated a few yards further south from the Bell. This is an early seventeenth-century building with a plaster faced road front. This first landlord appears to have been Abraham Crawley who held a licence to keep an ale house. However, in spite of being charged at the Quarter Sessions in 1626 for keeping a disorderly house, Crawley was appointed Constable of the Town Area in 1630. His son, John Crawley, later took over the King’s Arms and in 1659 he, too, was appointed Constable. 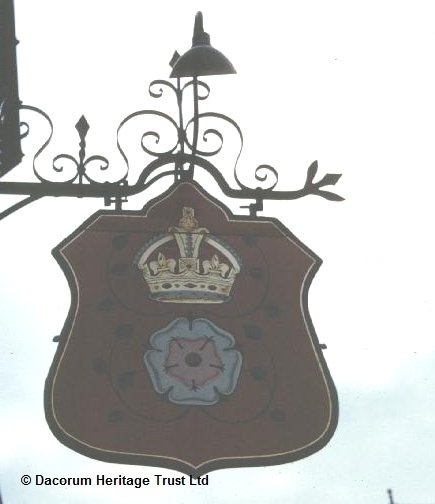 In 1750 the inn was renamed the Prince’s Arms and towards the end of the eighteenth century it merged with a neighbouring inn called the Black Inn, with John Mallotrot as landlord. Later the two inns separated, with the King’s Arms reverting to its original name. The King’s Arms then enjoyed an increase in trade when the Plait Market moved from Collet’s Yard in 1832 to the yard at the back of the inn. During the nineteenthcentury the King’s Arms competed with the Bell to provide catering services for the Bailiwick at the Town Hall. 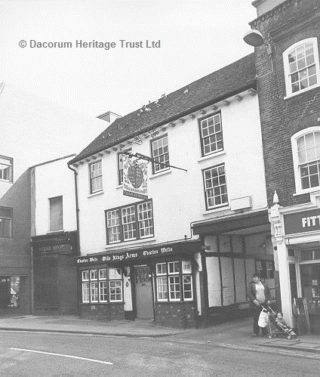 Situated further down from the King’s Arms, at what is now No 19, is the Rose and Crown. The building today is not the same as it was in 1523, when William Patewyn combined the business with his trade as a butcher, for the building was altered with a brick front at the beginning of the eigtheenth century. The Rose and Crown alleyway gave access to the cattle markets and the fairs held in the meadow at the back of the inn. On the opposite side of the street is the White Hart, which is the last of the four remaining inns. nlike the Bell, this timber-framed building does not have a false front, but is one of the seventeenth century inns which stood facing the original street. First registered as a tavern, the accommodation was poor as Richard Sear, the landlord, could only offer three beds to travellers. By the end of the nineteenth century, George Sanders, who had been in charge since 1838, was conducting a respectable business and the property was classified as an inn.